Private View: Sunday 11th June 2017, 11am – 4pm. The Exhibition continues until Saturday 1st July 2017, 5pm. There is something particularly exciting and rewarding when you know you have set eyes on a new and talented artist. Luckily, Annabel Playfair lived only ten minutes from my door and when she mentioned some time ago that she had a new body of work festooned around the house I was curious – I had heard good reports. How taken aback I was to see dazzling painting after painting up on the walls – with an exuberance and obvious joy for her immediate surroundings. There was a natural assurance about her canvasses wrapped up with a strong colour sense and use of form. Notoriously hard to impress, this time I took no time at all and here we are staging Annabel’s first solo exhibition at the Fosse. Annabel is no total newcomer; she was classically trained over five years at the City of Guilds in London, Chelsea Art School and Les Beaux Arts in Paris. Having brought up four children she started painting in earnest again and her confidence and artistic maturity has rapidly developed along with her reputation and fan base. She paints mainly en plein air. 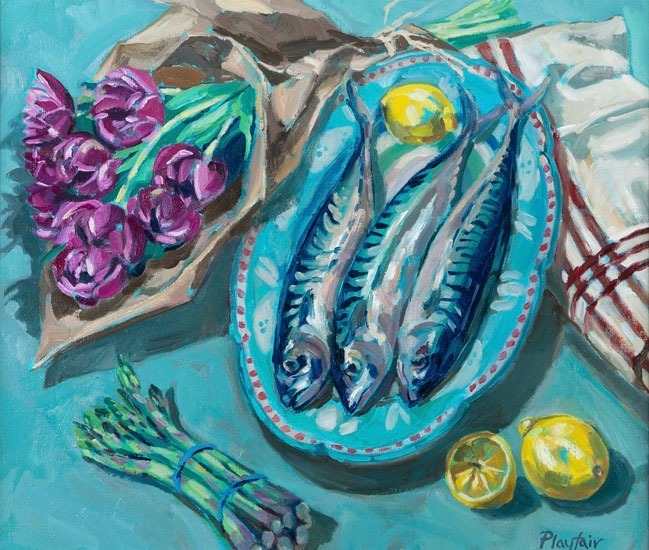 For this exhibition Annabel has travelled extensively with her easel, capturing the heat of the summer sun in Italy and Provence and the racing tides of Devon and Cornwall. Closer to home she is surrounded by bluebell woods and ewes with their lambs in the Spring, followed by linseed, barley, lavender and poppy fields in the Summer and fields full of hay bales in early Autumn. For the rest of the time she can be found at home capturing her immediate surroundings – a simple brown trout on a plate with a wedge of lemon or glorious still-lifes of lilies, tulips, chrysanthemums and peonies exuberantly painted on a grand scale. 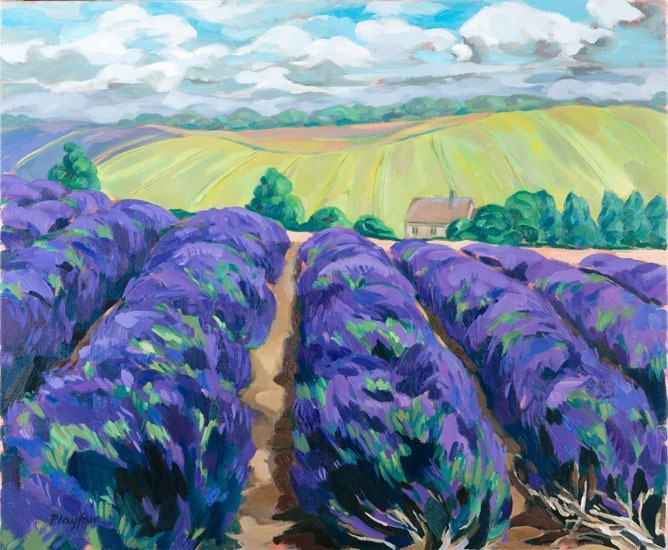 Annabel is a painterly painter, her works are living and breathing and I like that!